Among the changes: like Netvibes, Pageflakes and other personalized homepages, users will now be able to move most modules on the Newsvine home page around, or delete them altogether. 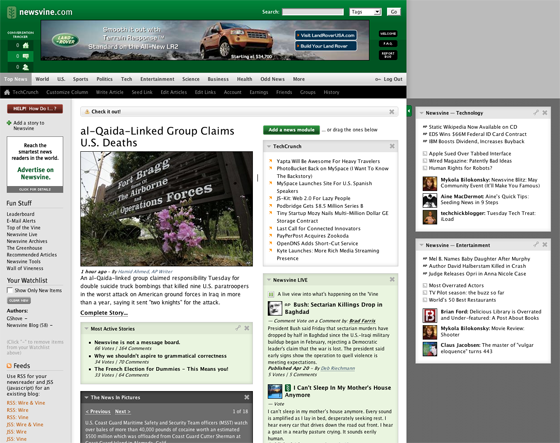 Users can also add whatever news feeds they want to the home page by adding a RSS feed module. Until now, web services that allow customization generally put the feature in a standalone area. Yahoo has my.yahoo, for example, but doesn’t allow users to make changes to the main Yahoo home page. Like their often-copied feature of allowing user comments to news items, this may be another way that Newsvine reshapes the online news industry. I wouldn’t be surprised to see the New York Times, USA Today and other sites allow users to create their own version of the newspaper, possibly even allowing outside RSS feeds in, in the next year or so. This builds intense user loyalty and makes it much more likely they’ll spend even more time on the site. Other features include the addition of local headlines and weather and a slideshow called “News In Pictures” that shows a continuous stream of AP pictures. Newsvine also just got bigger, stretching from 900 to 1240 pixels. The extra width can be collapsed with a click. Newsvine has raised just $1.25 million in a single round of financing in July 2005 from Second Avenue Partners. They have six employees. The site currently brings in 600,000 monthly unique visitors generating 3.5 million monthly page views.